For the transition period from ______________ to______________. The aggregate market value of the Common Stock held by non-affiliates of the registrant as of June 30, 2015 as reported on the NASDAQ Global Select Market, was $1,103,045,781.58 . Shares of Common Stock held by each executive officer and director and by each person who owns 10% or more of the outstanding Common Stock have been excluded in that such persons may be deemed to be affiliates. This determination of affiliate status is not necessarily a conclusive determination for other purposes. Portions of the definitive Proxy Statement relating to registrant’s Annual Meeting of Shareholders, to be held on April 28, 2016, are incorporated by reference in Items 10, 11, 12, 13 and 14 of Part III to the extent described therein. This report on Form 10-K contains forward-looking statements about Westamerica Bancorporation for which it claims the protection of the safe harbor provisions contained in the Private Securities Litigation Reform Act of 1995. Examples of forward-looking statements include, but are not limited to: (i) projections of revenues, expenses, income or loss, earnings or loss per share, the payment or nonpayment of dividends, capital structure and other financial items; (ii) statements of plans, objectives and expectations of the Company or its management or board of directors, including those relating to products or services; (iii) statements of future economic performance; and (iv) statements of assumptions underlying such statements. Words such as "believes", "anticipates", "expects", "intends", "targeted", "projected", "continue", "remain", "will", "should", "may" and other similar expressions are intended to identify forward-looking statements but are not the exclusive means of identifying such statements. These forward-looking statements are based on Management’s current knowledge and belief and include information concerning the Company’s possible or assumed future financial condition and results of operations. A number of factors, some of which are beyond the Company’s ability to predict or control, could cause future results to differ materially from those contemplated. These factors include but are not limited to (1) the length and severity of difficulties in the global, national and California economies and the effects of government efforts to address those difficulties; (2) liquidity levels in capital markets; (3) fluctuations in asset prices including, but not limited to stocks, bonds, real estate, and commodities; (4) the effect of acquisitions and integration of acquired businesses; (5) economic uncertainty created by terrorist threats and attacks on the United States, the actions taken in response, and the uncertain effect of these events on the national and regional economies; (6) changes in the interest rate environment; (7) changes in the regulatory environment; (8) competitive pressure in the banking industry; (9) operational risks including a failure or breach in data processing systems or those of third party vendors and other service providers, including as a result of cyber attacks or fraud; (10) volatility of interest rate sensitive loans, deposits and investments; (11) asset/liability management risks and liquidity risks; (12) the effect of natural disasters, including earthquakes, fire, flood, drought, and other disasters, on the uninsured value of loan collateral, the financial condition of debtors and issuers of investment securities, the economic conditions affecting the Company’s market place, and commodities and asset values, and (13) changes in the securities markets. The Company undertakes no obligation to update any forward-looking statements in this report. See also “Risk Factors” in Item 1A and other risk factors discussed elsewhere in this Report. Westamerica Bancorporation (the “Company”) is a bank holding company registered under the Bank Holding Company Act of 1956, as amended (“BHCA”). Its legal headquarters are located at 1108 Fifth Avenue, San Rafael, California 94901. Principal administrative offices are located at 4550 Mangels Boulevard, Fairfield, California 94534 and its telephone number is (707) 863-6000. The Company provides a full range of banking services to individual and corporate customers in Northern and Central California through its subsidiary bank, Westamerica Bank (“WAB” or the “Bank”). The principal communities served are located in Northern and Central California, from Mendocino, Lake and Nevada Counties in the north to Kern County in the south. The Company’s strategic focus is on the banking needs of small businesses. In addition, the Bank owns 100% of the capital stock of Community Banker Services Corporation (“CBSC”), a company engaged in providing the Company and its subsidiaries with data processing services and other support functions. The Company was incorporated under the laws of the State of California in 1972 as “Independent Bankshares Corporation” pursuant to a plan of reorganization among three previously unaffiliated Northern California banks. The Company operated as a multi-bank holding company until mid-1983, at which time the then six subsidiary banks were merged into a single bank named Westamerica Bank and the name of the holding company was changed to Westamerica Bancorporation. The Company acquired five banks within its immediate market area during the early to mid 1990’s. In April 1997, the Company acquired ValliCorp Holdings, Inc., parent company of ValliWide Bank, the largest independent bank holding company headquartered in Central California. Under the terms of all of the merger agreements, the Company issued shares of its common stock in exchange for all of the outstanding shares of the acquired institutions. The subsidiary banks acquired were merged with and into WAB. These six aforementioned business combinations were accounted for as poolings-of-interests. During the period 2000 through 2005, the Company acquired three additional banks. These acquisitions were accounted for using the purchase accounting method. On February 6, 2009, Westamerica Bank acquired the banking operations of County Bank (“County”) from the Federal Deposit Insurance Corporation (“FDIC”). On August 20, 2010, Westamerica Bank acquired assets and assumed liabilities of the former Sonoma Valley Bank (“Sonoma”) from the FDIC. The County and Sonoma acquired assets and assumed liabilities were measured at estimated fair values, as required by FASB ASC 805, Business Combinations. At December 31, 2015, the Company had consolidated assets of approximately $5.2 billion, deposits of approximately $4.5 billion and shareholders’ equity of approximately $532 million. The Company and its subsidiaries employed 813 full-time equivalent staff as of December 31, 2015. The following is not intended to be an exhaustive description of the statutes and regulations applicable to the Company’s or the Bank’s business. The description of statutory and regulatory provisions is qualified in its entirety by reference to the particular statutory or regulatory provisions. Moreover, major new legislation and other regulatory changes affecting the Company, the Bank, and the financial services industry in general have occurred in the last several years and can be expected to occur in the future. The nature, timing and impact of new and amended laws and regulations cannot be accurately predicted. The Company is a bank holding company subject to the BHCA. The Company reports to, is registered with, and may be examined by, the Board of Governors of the Federal Reserve System (“FRB”). The FRB also has the authority to examine the Company’s subsidiaries. The Company is a bank holding company within the meaning of Section 3700 of the California Financial Code. As such, the Company and the Bank are subject to examination by, and may be required to file reports with, the Commissioner of the California Department of Business Oversight (the “Commissioner”). The FRB has significant supervisory and regulatory authority over the Company and its affiliates. The FRB requires the Company to maintain certain levels of capital. See “Capital Standards.” The FRB also has the authority to take enforcement action against any bank holding company that commits any unsafe or unsound practice, or violates certain laws, regulations or conditions imposed in writing by the FRB. Under the BHCA, the Company is required to obtain the prior approval of the FRB before it acquires, merges or consolidates with any bank or bank holding company. Any company seeking to acquire, merge or consolidate with the Company also would be required to obtain the prior approval of the FRB. The Company is generally prohibited under the BHCA from acquiring ownership or control of more than 5% of any class of voting shares of any company that is not a bank or bank holding company and from engaging directly or indirectly in activities other than banking, managing banks, or providing services to affiliates of the holding company. However, a bank holding company, with the approval of the FRB, may engage, or acquire the voting shares of companies engaged, in activities that the FRB has determined to be closely related to banking or managing or controlling banks. A bank holding company must demonstrate that the benefits to the public of the proposed activity will outweigh the possible adverse effects associated with such activity. The FRB generally prohibits a bank holding company from declaring or paying a cash dividend that would impose undue pressure on the capital of subsidiary banks or would be funded only through borrowing or other arrangements which might adversely affect a bank holding company’s financial position. Under the FRB policy, a bank holding company should not continue its existing rate of cash dividends on its common stock unless its net income is sufficient to fully fund each dividend and its prospective rate of earnings retention appears consistent with its capital needs, asset quality and overall financial condition. See the section entitled “Restrictions on Dividends and Other Distributions” for additional restrictions on the ability of the Company and the Bank to pay dividends. Transactions between the Company and the Bank are restricted under Regulation W. The regulation codifies prior interpretations of the FRB and its staff under Sections 23A and 23B of the Federal Reserve Act. In general, subject to certain specified exemptions, a bank or its subsidiaries are limited in their ability to engage in “covered transactions” with affiliates: (a) to an amount equal to 10% of the bank’s capital and surplus, in the case of covered transactions with any one affiliate; and (b) to an amount equal to 20% of the bank’s capital and surplus, in the case of covered transactions with all affiliates. The Company is considered to be an affiliate of the Bank. A “covered transaction” includes, among other things, a loan or extension of credit to an affiliate; a purchase of securities issued by an affiliate; a purchase of assets from an affiliate, with some exceptions; and the issuance of a guarantee, acceptance or letter of credit on behalf of an affiliate. Federal regulations governing bank holding companies and change in bank control (Regulation Y) provide for a streamlined and expedited review process for bank acquisition proposals submitted by well-run bank holding companies. These provisions of Regulation Y are subject to numerous qualifications, limitations and restrictions. In order for a bank holding company to qualify as “well-run,” both it and the insured depository institutions which it controls must meet the “well capitalized” and “well managed” criteria set forth in Regulation Y. The Gramm-Leach-Bliley Act (the “GLBA”), or the Financial Services Act of 1999, repealed provisions of the Glass-Steagall Act, which had prohibited commercial banks and securities firms from affiliating with each other and engaging in each other’s businesses. Thus, many of the barriers prohibiting affiliations between commercial banks and securities firms have been eliminated. The BHCA was also amended by the GLBA to allow new “financial holding companies” (“FHCs”) to offer banking, insurance, securities and other financial products to consumers. Specifically, the GLBA amended section 4 of the BHCA in order to provide for a framework for the engagement in new financial activities. A bank holding company (“BHC”) may elect to become an FHC if all its subsidiary depository institutions are well capitalized and well managed. If these requirements are met, a BHC may file a certification to that effect with the FRB and declare that it elects to become an FHC. After the certification and declaration is filed, the FHC may engage either de novo or through an acquisition in any activity that has been determined by the FRB to be financial in nature or incidental to such financial activity. BHCs may engage in financial activities without prior notice to the FRB if those activities qualify under the list of permissible activities in section 4(k) of the BHCA. However, notice must be given to the FRB within 30 days after an FHC has commenced one or more of the financial activities. The Company has not elected to become an FHC. The Bank is a California state-chartered Federal Reserve member bank and its deposits are insured by the FDIC. The Bank is subject to regulation, supervision and regular examination by the California Department of Business Oversight (“DBO”), and the FRB. The regulations of these agencies affect most aspects of the Bank’s business and prescribe permissible types of loans and investments, the amount of required reserves, requirements for branch offices, the permissible scope of its activities and various other requirements. In addition to federal banking law, the Bank is also subject to applicable provisions of California law. Under California law, the Bank is subject to various restrictions on, and requirements regarding, its operations and administration including the maintenance of branch offices and automated teller machines, capital requirements, deposits and borrowings, shareholder rights and duties, and investment and lending activities. In addition, the Federal Deposit Insurance Corporation Improvement Act (“FDICIA”) imposes limitations on the activities and equity investments of state chartered, federally insured banks. FDICIA also prohibits a state bank from making an investment or engaging in any activity as a principal that is not permissible for a national bank, unless the Bank is adequately capitalized and the FDIC approves the investment or activity after determining that such investment or activity does not pose a significant risk to the deposit insurance fund. Centralized responsibility for consumer financial protection by creating a new agency, the Consumer Financial Protection Bureau, responsible for implementing, examining and (as to banks with $10 billion or more in assets) enforcing compliance with federal consumer financial laws. Restricted the preemption of state law by federal law and disallowed subsidiaries and affiliates of national banks from availing themselves of such preemption. Applied the same leverage and risk-based capital requirements that would apply to insured depository institutions to most bank holding companies. Required bank regulatory agencies to seek to make their capital requirements for banks countercyclical so that capital requirements increase in times of economic expansion and decrease in times of economic contraction. Changed the assessment base for federal deposit insurance from the amount of insured deposits to consolidated assets less tangible capital, eliminated the ceiling on the size of the Deposit Insurance Fund ("DIF") and increased the floor of the size of the DIF. Imposed comprehensive regulation of the over-the-counter derivatives market, which would include certain provisions that would effectively prohibit insured depository institutions from conducting certain derivatives businesses in the institution itself. Required large, publicly traded bank holding companies to create a risk committee responsible for the oversight of enterprise risk management. Implemented corporate governance revisions, including with regard to executive compensation and proxy access by shareholders, that would apply to all public companies, not just financial institutions. Made permanent the $250 thousand limit for federal deposit insurance. Repealed the federal prohibitions on the payment of interest on demand deposits, thereby permitting depository institutions to pay interest on business transaction and other accounts. Amended the Electronic Fund Transfer Act ("EFTA") to, among other things, give the FRB the authority to establish rules regarding interchange fees charged for electronic debit transactions by payment card issuers having assets over $10 billion and to enforce a new statutory requirement that such fees be reasonable and proportional to the actual cost of a transaction to the issuer. While the Company’s assets are currently less than $10 billion, interchange fees charged by larger institutions may dictate the level of fees smaller institutions will be able to charge to remain competitive. Many aspects of the Dodd-Frank Act are subject to rulemaking and implementation of new regulations and will take effect over several years, making it difficult to anticipate the overall financial impact on the Company, its customers or the financial industry more generally. Provisions in the legislation that affect the payment of interest on demand deposits and interchange fees may increase the costs associated with deposits as well as place limitations on certain revenues those deposits may generate. The federal banking agencies have risk-based capital adequacy guidelines intended to provide a measure of capital adequacy that reflects the degree of risk associated with a banking organization’s operations for both transactions resulting in assets being recognized on the balance sheet as assets, and the extension of credit facilities such as letters of credit and recourse arrangements, which are recorded as off balance sheet items. Under these guidelines, nominal dollar amounts of assets and credit equivalent amounts of off balance sheet items are multiplied by one of several risk adjustment percentages, which range from 0% for assets with low credit risk, such as certain U.S. government securities, to 1250% for assets with relatively higher credit risk, such as certain securitizations. A banking organization’s risk-based capital ratios are obtained by dividing its qualifying capital by its total risk-adjusted assets and off balance sheet items. The federal banking agencies take into consideration concentrations of credit risk and risks from nontraditional activities, as well as an institution’s ability to manage those risks, when determining the adequacy of an institution’s capital. This evaluation is made as a part of the institution’s regular safety and soundness examination. The federal banking agencies also consider interest rate risk (related to the interest rate sensitivity of an institution’s assets and liabilities, and its off balance sheet financial instruments) in the evaluation of a bank’s capital adequacy. As of December 31, 2015, the Company’s and the Bank’s respective ratios exceeded applicable regulatory requirements. See Note 9 to the consolidated financial statements for capital ratios of the Company and the Bank, compared to the standards for well capitalized depository institutions and for minimum capital requirements. On July 2, 2013, the Federal Reserve Board approved a final rule that implements changes to the regulatory capital framework for all banking organizations over a transitional period 2015 through 2018. See the sections entitled “Capital Resources and Capital to Risk-Adjusted Assets” in Item 7. Management’s Discussion and Analysis of Financial Condition and Results of Operations for additional information. FDICIA requires each federal banking agency to take prompt corrective action to resolve the problems of insured depository institutions, including but not limited to those that fall below one or more prescribed minimum capital ratios. An institution that, based upon its capital levels, is classified as “well capitalized,” “adequately capitalized” or “undercapitalized” may be treated as though it were in the next lower capital category if the appropriate federal banking agency, after notice and opportunity for hearing, determines that an unsafe or unsound condition or an unsafe or unsound practice warrants such treatment. At each successive lower capital category, an insured depository institution is subject to more restrictions. In addition to measures taken under the prompt corrective action provisions, commercial banking organizations may be subject to potential enforcement actions by the federal banking agencies for unsafe or unsound practices in conducting their businesses or for violations of any law, rule, regulation or any condition imposed in writing by the agency or any written agreement with the agency. The Company’s ability to pay dividends to its shareholders is subject to the restrictions set forth in the California General Corporation Law (“CGCL”). The CGCL provides that a corporation may make a distribution to its shareholders if (i) the corporation’s retained earnings equal or exceed the amount of the proposed distribution plus unpaid accrued dividends, (if any) on securities with a dividend preference, or (ii) immediately after the dividend, the corporation’s total assets equal or exceed total liabilities plus unpaid accrued dividends (if any) on securities with a dividend preference. FDICIA also implemented certain specific restrictions on transactions and required federal banking regulators to adopt overall safety and soundness standards for depository institutions related to internal control, loan underwriting and documentation, and asset growth. Among other things, FDICIA limits the interest rates paid on deposits by undercapitalized institutions, restricts the use of brokered deposits, limits the aggregate extensions of credit by a depository institution to an executive officer, director, principal shareholder or related interest, and reduces deposit insurance coverage for deposits offered by undercapitalized institutions for deposits by certain employee benefits accounts. The federal banking agencies may require an institution to submit an acceptable compliance plan as well as have the flexibility to pursue other more appropriate or effective courses of action given the specific circumstances and severity of an institution’s noncompliance with one or more standards. Federal banking agencies require banks to maintain adequate valuation allowances for potential credit losses. The Company has an internal staff that continually reviews loan quality and reports to the Board of Directors. This analysis includes a detailed review of the classification and categorization of problem loans, assessment of the overall quality and collectability of the loan portfolio, consideration of loan loss experience, trends in problem loans, concentration of credit risk, and current economic conditions, particularly in the Bank’s market areas. Based on this analysis, Management, with the review and approval of the Board, determines the adequate level of allowance required. The allowance is allocated to different segments of the loan portfolio, but the entire allowance is available for the loan portfolio in its entirety. The power of the board of directors of an insured depository institution to declare a cash dividend or other distribution with respect to capital is subject to statutory and regulatory restrictions which limit the amount available for such distribution depending upon the earnings, financial condition and cash needs of the institution, as well as general business conditions. FDICIA prohibits insured depository institutions from paying management fees to any controlling persons or, with certain limited exceptions, making capital distributions, including dividends, if, after such transaction, the institution would be undercapitalized. In addition to the restrictions imposed under federal law, banks chartered under California law generally may only pay cash dividends to the extent such payments do not exceed the lesser of retained earnings of the bank or the bank’s net income for its last three fiscal years (less any distributions to shareholders during this period). In the event a bank desires to pay cash dividends in excess of such amount, the bank may pay a cash dividend with the prior approval of the Commissioner in an amount not exceeding the greatest of the bank’s retained earnings, the bank’s net income for its last fiscal year or the bank’s net income for its current fiscal year. The federal banking agencies also have the authority to prohibit a depository institution from engaging in business practices which are considered to be unsafe or unsound, possibly including payment of dividends or other payments under certain circumstances even if such payments are not expressly prohibited by statute. Substantially all of the deposits of the Bank are insured up to applicable limits by the Deposit Insurance Fund ("DIF") of the FDIC and are subject to deposit insurance assessments to maintain the DIF. The FDIC utilizes a risk-based assessment system that imposes insurance premiums based upon a risk matrix that takes into account a bank's capital level, asset quality and supervisory rating ("CAMELS rating"). In October 2010, the FDIC adopted a new DIF restoration plan to ensure that the DIF reserve ratio reaches 1.35% by September 30, 2020, as required by the Dodd-Frank Act. At least semi-annually, the FDIC will update its loss and income projections for the fund and, if needed, will increase or decrease assessment rates, following notice-and-comment rulemaking if required. In February 2011, the FDIC issued a final rule changing the deposit insurance assessment base from total domestic deposits to average total assets minus average tangible equity, as required by the Dodd-Frank Act, effective April 1, 2011. The FDIC also issued a final rule revising the deposit insurance assessment system for “large” institutions having more than $10 billion in assets and another for "highly complex" institutions that have over $50 billion in assets and are fully owned by a parent with over $500 billion in assets. The Bank is neither a “large” nor “highly complex” institution. Under the new assessment rules, the initial base assessment rates range from 5 to 35 basis points, and after potential adjustments for unsecured debt and brokered deposits, assessment rates range from 2.5 to 45 basis points. The Company cannot provide any assurance as to the effect of any future changes in its deposit insurance premium rates. The Bank is subject to certain fair lending requirements and reporting obligations involving home mortgage lending operations and Community Reinvestment Act (“CRA”) activities. The CRA generally requires the federal banking agencies to evaluate the record of financial institutions in meeting the credit needs of their local communities, including low and moderate income neighborhoods. In addition to substantive penalties and corrective measures that may be required for a violation of certain fair lending laws, the federal banking agencies may take compliance with such laws and CRA into account when regulating and supervising other activities including merger applications. The GLBA, in addition to the previously described changes in permissible nonbanking activities permitted to banks, BHCs and FHCs, also required the federal banking agencies, among other federal regulatory agencies, to adopt regulations governing the privacy of consumer financial information. The Bank is subject to the FRB’s regulations in this area. The federal bank regulatory agencies have established standards for safeguarding nonpublic personal information about customers that implement provisions of the GLBA (the “Guidelines”). Among other things, the Guidelines require each financial institution, under the supervision and ongoing oversight of its Board of Directors or an appropriate committee thereof, to develop, implement and maintain a comprehensive written information security program designed to ensure the security and confidentiality of customer information, to protect against any anticipated threats or hazards to the security or integrity of such information, and to protect against unauthorized access to or use of such information that could result in substantial harm or inconvenience to any customer. Title III of the Uniting and Strengthening America by Providing Appropriate Tools Required to Intercept and Obstruct Terrorism Act of 2001 (“USA Patriot Act”) is the International Money Laundering Abatement and Anti-Terrorist Financing Act of 2001. It includes numerous provisions for fighting international money laundering and blocking terrorist access to the U.S. financial system. The goal of Title III is to prevent the U.S. financial system and the U.S. clearing mechanisms from being used by parties suspected of terrorism, terrorist financing and money laundering. The provisions of Title III of the USA Patriot Act which affect the Bank are generally set forth as amendments to the Bank Secrecy Act. These provisions relate principally to U.S. banking organizations’ relationships with foreign banks and with persons who are resident outside the United States. The USA Patriot Act does not impose any filing or reporting obligations for banking organizations, but does require certain additional due diligence and recordkeeping practices. The stated goals of the Sarbanes-Oxley Act of 2002 (“Sarbanes-Oxley”) are to increase corporate responsibility, to provide for enhanced penalties for accounting and auditing improprieties at publicly traded companies and to protect investors by improving the accuracy and reliability of corporate disclosures pursuant to the securities laws. Sarbanes-Oxley generally applies to all companies, both U.S. and non-U.S., that file or are required to file periodic reports under the Securities Exchange Act of 1934 (the “Exchange Act”). Sarbanes-Oxley includes very specific additional disclosure requirements and corporate governance rules, required the SEC and securities exchanges to adopt extensive additional disclosure, corporate governance and other related rules and mandates further studies of certain issues. Sarbanes-Oxley represents significant federal involvement in matters traditionally left to state regulatory systems, such as the regulation of the accounting profession, and to state corporate law, such as the relationship between a board of directors and management and between a board of directors and its committees and public company shareholders. Sarbanes-Oxley addresses, among other matters: (i) independent audit committees for reporting companies whose securities are listed on national exchanges or automated quotation systems (the “Exchanges”) and expanded duties and responsibilities for audit committees; (ii) certification of financial statements by the chief executive officer and the chief financial officer; (iii) the forfeiture of bonuses or other incentive-based compensation and profits from the sale of an issuer’s securities by directors and senior officers in the twelve month period following initial publication of any financial statements that later require restatement; (iv) a prohibition on insider trading during pension plan blackout periods; (v) disclosure of off-balance sheet transactions; (vi) a prohibition on personal loans to directors and officers under most circumstances with exceptions for certain normal course transactions by regulated financial institutions; (vii) expedited electronic filing requirements related to trading by insiders in an issuer’s securities on Form 4; (viii) disclosure of a code of ethics and filing a Form 8-K for a change or waiver of such code; (ix) accelerated filing of periodic reports; (x) the formation of the Public Company Accounting Oversight Board (“PCAOB”) to regulate public accounting firms and the audit of public companies that are subject to the securities laws; (xi) auditor independence; (xii) internal control evaluation and reporting; and (xiii) various increased criminal penalties for violations of securities laws. In November 2007, federal banking agencies together with the National Credit Union Administration and Federal Trade Commission adopted regulations under the Fair and Accurate Credit Transactions Act of 2003 to require financial institutions and other creditors to develop and implement a written identity theft prevention program to detect, prevent and mitigate identity theft in connection with certain new and existing accounts. Covered accounts generally include consumer accounts and other accounts that present a reasonably foreseeable risk of identity theft. Each institution’s program must include policies and procedures designed to: (i) identify indicators, or “red flags,” of possible risk of identity theft; (ii) detect the occurrence of red flags; (iii) respond appropriately to red flags that are detected; and (iv) ensure that the program is updated periodically as appropriate to address changing circumstances. The regulations include guidelines that each institution must consider and, to the extent appropriate, include in its program. Changes to state laws and regulations (including changes in interpretation or enforcement) can affect the operating environment of BHCs and their subsidiaries in substantial and unpredictable ways. From time to time, various legislative and regulatory proposals are introduced. These proposals, if codified, may change banking statutes and regulations and the Company’s operating environment in substantial and unpredictable ways. If codified, these proposals could increase or decrease the cost of doing business, limit or expand permissible activities or affect the competitive balance among banks, savings associations, credit unions and other financial institutions. The Company cannot accurately predict whether those changes in laws and regulations will occur, and, if those changes occur, the ultimate effect they would have upon our financial condition or results of operations. It is likely, however, that the current level of enforcement and compliance-related activities of federal and state authorities will continue and potentially increase. In the past, the Bank’s principal competitors for deposits and loans have been major banks and smaller community banks, savings and loan associations and credit unions. To a lesser extent, competition was also provided by thrift and loans, mortgage brokerage companies and insurance companies. Other institutions, such as brokerage houses, mutual fund companies, credit card companies, and certain retail establishments have offered investment vehicles that also compete with banks for deposit business. Federal legislation in recent years has encouraged competition between different types of financial institutions and fostered new entrants into the financial services market. Legislative changes, as well as technological and economic factors, can be expected to have an ongoing impact on competitive conditions within the financial services industry. While the future impact of regulatory and legislative changes cannot be predicted with certainty, the business of banking will remain highly competitive. Readers and prospective investors in the Company’s securities should carefully consider the following risk factors as well as the other information contained or incorporated by reference in this report. The risks and uncertainties described below are not the only ones facing the Company. Additional risks and uncertainties that Management is not aware of or focused on or that Management currently deems immaterial may also impair the Company’s business operations. This report is qualified in its entirety by these risk factors. If any of the following risks actually occur, the Company’s financial condition and results of operations could be materially and adversely affected. If this were to happen, the value of the company’s securities could decline significantly, and investors could lose all or part of their investment in the Company’s common stock. Changes in interest rates could reduce income and cash flow. The discussion in this report under “Item 7 Management’s Discussion and Analysis of Financial Condition and Results of Operations – Asset, Liability and Market Risk Management” and “- Liquidity and Funding” and “Item 7A Quantitative and Qualitative Disclosures About Market Risk” is incorporated by reference in this paragraph. The Company’s income and cash flow depend to a great extent on the difference between the interest earned on loans and investment securities and the interest paid on deposits and other borrowings, and the Company’s success in competing for loans and deposits. The Company cannot control or prevent changes in the level of interest rates which fluctuate in response to general economic conditions, the policies of various governmental and regulatory agencies, in particular, the Federal Open Market Committee of the FRB, and pricing practices of the Company’s competitors. Changes in monetary policy, including changes in interest rates, will influence the origination of loans, the purchase of investments, the generation of deposits and other borrowings, and the rates received on loans and investment securities and paid on deposits and other liabilities. Changes in capital market conditions could reduce asset valuations. Capital market conditions, including liquidity, investor confidence, bond issuer credit worthiness, perceived counter-party risk, the supply of and demand for financial instruments, the financial strength of market participants, and other factors can materially impact the value of the Company’s assets. An impairment in the value of the Company’s assets could result in asset write-downs, reducing the Company’s asset values, earnings, and equity. The market for some of the investment securities held in the Company’s portfolio can be extremely volatile. Volatile market conditions may detrimentally affect the value of these securities, such as through reduced valuations due to the perception of heightened credit and liquidity risks. There can be no assurance that the declines in market value will not result in other than temporary impairments of these assets, which would lead to loss recognition that could have a material adverse effect on the Company’s net income and capital levels. The weakness of other financial institutions could adversely affect the Company. Financial services institutions are interrelated as a result of trading, clearing, counterparty, or other relationships. The Company routinely executes transactions with counterparties in the financial services industry, including brokers and dealers, commercial banks, investment banks, and other institutional clients. Many of these transactions expose the Company to credit risk in the event of default of the Company’s counterparty or client. In addition, the Company’s credit risk may be increased when the collateral the Company holds cannot be realized or is liquidated at prices not sufficient to recover the full amount of the secured obligation. There is no assurance that any such losses would not materially and adversely affect the Company’s results of operations or earnings. Shares of Company common stock eligible for future sale or grant of stock options could have a dilutive effect on the market for Company common stock and could adversely affect the market price. The Articles of Incorporation of the Company authorize the issuance of 150 million shares of common stock (and two additional classes of 1 million shares each, denominated “Class B Common Stock” and “Preferred Stock”, respectively) of which approximately 25.5 million shares of common stock were outstanding at December 31, 2015. Pursuant to its stock option plans, at December 31, 2015, the Company had outstanding options for 1.5 million shares of common stock, of which 1.1 million were currently exercisable. As of December 31, 2015, 1.5 million shares of Company common stock remained available for grants under the Company’s stock option plans. Sales of substantial amounts of Company common stock in the public market could adversely affect the market price of its common stock. The Company’s payment of dividends on common stock could be eliminated or reduced. Holders of the Company’s common stock are entitled to receive dividends only when, as and if declared by the Company’s Board of Directors. Although the Company has historically paid cash dividends on the Company’s common stock, the Company is not required to do so and the Company’s Board of Directors could reduce or eliminate the Company’s common stock dividend in the future. The Company could repurchase shares of its common stock at price levels considered excessive. The Company repurchases and retires its common stock in accordance with Board of Directors-approved share repurchase programs. At December 31, 2015, approximately 1.7 million shares remained available to repurchase under such plans. The Company has been active in repurchasing and retiring shares of its common stock when alternative uses of excess capital, such as acquisitions, have been limited. The Company could repurchase shares of its common stock at price levels considered excessive, thereby spending more cash on such repurchases as deemed reasonable and effectively retiring fewer shares than would be retired if repurchases were affected at lower prices. The Company invests in loans that contain inherent credit risks that may cause the Company to incur losses. The Company can provide no assurance that the credit quality of the loan portfolio will not deteriorate in the future and that such deterioration will not adversely affect the Company. The Company’s operations are concentrated geographically in California, and poor economic conditions may cause the Company to incur losses. Substantially all of the Company’s business is located in California. A portion of the loan portfolio of the Company is dependent on real estate. At December 31, 2015, real estate served as the principal source of collateral with respect to approximately 53% of the Company’s loan portfolio. The Company’s financial condition and operating results will be subject to changes in economic conditions in California. The California economy is recovering from a severe recession. Much of the California real estate market experienced a decline in values of varying degrees. This decline had an adverse impact on the business of some of the Company’s borrowers and on the value of the collateral for many of the Company’s loans. Generally, the counties surrounding and near San Francisco Bay have been recovering from the recent recession more soundly than counties in the California “Central Valley,” from Sacramento in the north to Bakersfield in the south. Approximately 25% of the Company’s loans are to borrowers in the California “Central Valley.” Economic conditions in California are subject to various uncertainties at this time, including the pace of recovery in construction and real estate sectors, the effect of drought on the agricultural sector and its infrastructure, and the California state government’s budgetary difficulties and fiscal condition. The Company can provide no assurance that conditions in the California economy will not deteriorate in the future and that such deterioration will not adversely affect the Company. The markets in which the Company operates are subject to the risk of earthquakes and other natural disasters. All of the properties of the Company are located in California. Also, most of the real and personal properties which currently secure a majority of the Company’s loans are located in California. California is prone to earthquakes, brush and forest fires, flooding, drought and other natural disasters. In addition to possibly sustaining uninsured damage to its own properties, if there is a major earthquake, flood, drought, fire or other natural disaster, the Company faces the risk that many of its borrowers may experience uninsured property losses, or sustained job interruption and/or loss which may materially impair their ability to meet the terms of their loan obligations. A major earthquake, flood, prolonged drought, fire or other natural disaster in California could have a material adverse effect on the Company’s business, financial condition, results of operations and cash flows. Adverse changes in general business or economic conditions could have a material adverse effect on the Company’s financial condition and results of operations. · an impairment in the value of real estate owned by the Company. The recent financial crisis led to the failure or merger of a number of financial institutions. Financial institution failures can result in further losses as a consequence of defaults on securities issued by them and defaults under contracts entered into with such entities as counterparties. Weak economic conditions can significantly weaken the strength and liquidity of financial institutions. The Company’s financial performance generally, and in particular the ability of borrowers to pay interest on and repay principal of outstanding loans and the value of collateral securing those loans, is highly dependent upon the business environment in the markets where the Company operates, in the State of California and in the United States as a whole. A favorable business environment is generally characterized by, among other factors, economic growth, healthy labor markets, efficient capital markets, low inflation, high business and investor confidence, and strong business earnings. Unfavorable or uncertain economic and market conditions can be caused by: declines in economic growth, high rates of unemployment, deflation, declines in business activity or consumer, investor or business confidence; limitations on the availability of or increases in the cost of credit and capital; increases in inflation or interest rates; natural disasters; or a combination of these or other factors. Such business conditions could adversely affect the credit quality of the Company’s loans, the demand for loans, loan volumes and related revenue, securities valuations, amounts of deposits, availability of funding, results of operations and financial condition. Restrictions on dividends and other distributions could limit amounts payable to the Company. As a holding company, a substantial portion of the Company’s cash flow typically comes from dividends paid by the Bank. Various statutory provisions restrict the amount of dividends the Company’s subsidiaries can pay to the Company without regulatory approval. A reduction in subsidiary dividends paid to the Company could limit the capacity of the Company to pay dividends. In addition, if any of the Company’s subsidiaries were to liquidate, that subsidiary’s creditors will be entitled to receive distributions from the assets of that subsidiary to satisfy their claims against it before the Company, as a holder of an equity interest in the subsidiary, will be entitled to receive any of the assets of the subsidiary. Adverse effects of changes in banking or other laws and regulations or governmental fiscal or monetary policies could adversely affect the Company. The Company is subject to significant federal and state regulation and supervision, which is primarily for the benefit and protection of the Company’s customers and not for the benefit of investors. In the past, the Company’s business has been materially affected by these regulations. As an example, the FRB amended Regulation E, which implements the Electronic Fund Transfer Act, in a manner that limits the ability of a financial institution to assess an overdraft fee for paying automated teller machine (ATM) and one-time debit card transactions that overdraw a consumer’s account, unless the consumer affirmatively consents, or opts in, to the institution’s payment of overdrafts for these transactions. Implementation of the new provisions significantly reduced overdraft fees assessed by the Bank. Laws, regulations or policies, including accounting standards and interpretations currently affecting the Company and the Company’s subsidiaries, may change at any time. Regulatory authorities may also change their interpretation of these statutes and regulations. Therefore, the Company’s business may be adversely affected by any future changes in laws, regulations, policies or interpretations or regulatory approaches to compliance and enforcement including future acts of terrorism, major U.S. corporate bankruptcies and reports of accounting irregularities at U.S. public companies. Additionally, the Company’s business is affected significantly by the fiscal and monetary policies of the federal government and its agencies. The Company is particularly affected by the policies of the FRB, which regulates the supply of money and credit in the United States of America. Among the instruments of monetary policy available to the FRB are (a) conducting open market operations in U.S. government securities, (b) changing the discount rates of borrowings by depository institutions, (c) changing interest rates paid on balances financial institutions deposit with the FRB, and (d) imposing or changing reserve requirements against certain borrowings by banks and their affiliates. These methods are used in varying degrees and combinations to directly affect the availability of bank loans and deposits, as well as the interest rates charged on loans and paid on deposits. The policies of the FRB may have a material effect on the Company’s business, results of operations and financial condition. Under long- standing policy of the FRB, a BHC is expected to act as a source of financial strength for its subsidiary banks. As a result of that policy, the Company may be required to commit financial and other resources to its subsidiary bank in circumstances where the Company might not otherwise do so. Following the most recent recession, the FRB has been providing vast amounts of liquidity into the banking system. The FRB has been purchasing large quantities of U.S. government securities, including agency-backed mortgage securities, increasing the demand for such securities thereby reducing interest rates. The FRB began reducing these asset purchase activities in the fourth quarter 2013 and the Federal Open Market Committee increased the target range for the federal funds rate to 1/4 to 1/2 percent on December 16, 2015 which could reduce liquidity in the markets and cause interest rates to rise, thereby increasing funding costs to the Bank, reducing the availability of funds to the Bank to finance its existing operations, and causing fixed-rate investment securities and loans to decline in value. Federal and state governments could pass legislation detrimental to the Company’s performance. As an example, the Company could experience higher credit losses because of federal or state legislation or regulatory action that reduces the amount the Bank's borrowers are otherwise contractually required to pay under existing loan contracts. Also, the Company could experience higher credit losses because of federal or state legislation or regulatory action that limits or delays the Bank's ability to foreclose on property or other collateral or makes foreclosure less economically feasible. The FDIC insures deposits at insured financial institutions up to certain limits. The FDIC charges insured financial institutions premiums to maintain the Deposit Insurance Fund. The FDIC may increase premium assessments to maintain adequate funding of the Deposit Insurance Fund. The behavior of depositors in regard to the level of FDIC insurance could cause our existing customers to reduce the amount of deposits held at the Bank, and could cause new customers to open deposit accounts at the Bank. The level and composition of the Bank's deposit portfolio directly impacts the Bank's funding cost and net interest margin. The accuracy of the Company’s judgments and estimates about financial and accounting matters will impact operating results and financial condition. The discussion under “Item 7 Management’s Discussion and Analysis of Financial Condition and Results of Operations - Critical Accounting Policies” in this report and the information referred to in that discussion is incorporated by reference in this paragraph. The Company makes certain estimates and judgments in preparing its financial statements. The quality and accuracy of those estimates and judgments will have an impact on the Company’s operating results and financial condition. The Company’s information systems may experience an interruption or breach in security. The Company relies heavily on communications and information systems, including those of third party vendors and other service providers, to conduct its business. Any failure, interruption or breach in security of these systems could result in failures or disruptions in the Company’s data processing, accounting, customer relationship management and other systems. Communication and information systems failures can result from a variety of risks including, but not limited to, events that are wholly or partially out of the Company’s control, such as telecommunication line integrity, weather, terrorist acts, natural disasters, accidental disasters, unauthorized breaches of security systems, energy delivery systems, cyber attacks, and other events. Although the Company devotes significant resources to maintain and regularly upgrade its systems and processes that are designed to protect the security of the Company’s computer systems, software, networks and other technology assets and the confidentiality, integrity and availability of information belonging to the Company and its customers, there is no assurance that any such failures, interruptions or security breaches will not occur or, if they do occur, that they will be adequately corrected by the Company or its vendors. The occurrence of any such failures, interruptions or security breaches could damage the Company’s reputation, result in a loss of customer business, subject the Company to additional regulatory scrutiny, or expose the Company to litigation and possible financial liability, any of which could have a material adverse effect on the Company’s financial condition and results of operations. The Company’s controls and procedures may fail or be circumvented. Management regularly reviews and updates the Company’s internal control over financial reporting, disclosure controls and procedures, and corporate governance policies and procedures. The Company maintains controls and procedures to mitigate against risks such as processing system failures and errors, and customer or employee fraud, and maintains insurance coverage for certain of these risks. Any system of controls and procedures, however well designed and operated, is based in part on certain assumptions and can provide only reasonable, not absolute, assurances that the objectives of the system are met. Events could occur which are not prevented or detected by the Company’s internal controls or are not insured against or are in excess of the Company’s insurance limits or insurance underwriters’ financial capacity. Any failure or circumvention of the Company’s controls and procedures or failure to comply with regulations related to controls and procedures could have a material adverse effect on the Company’s business, results of operations and financial condition. Westamerica Bank is engaged in the banking business through 88 branch offices in 21 counties in Northern and Central California. WAB believes all of its offices are constructed and equipped to meet prescribed security requirements. The Company owns 32 banking office locations and one centralized administrative service center facility and leases 64 facilities. Most of the leases contain renewal options and provisions for rental increases, principally for changes in the cost of living index, and for changes in other operating costs such as property taxes and maintenance. Neither the Company nor any of its subsidiaries is a party to any material pending legal proceeding, nor is their property the subject of any material pending legal proceeding, other than ordinary routine legal proceedings arising in the ordinary course of the Company’s business. None of these proceedings is expected to have a material adverse impact upon the Company’s business, financial position or results of operations. As of January 31, 2016, there were approximately 6,100 shareholders of record of the Company’s common stock. The notes to the consolidated financial statements included in this report contain additional information regarding the Company’s capital levels, capital structure, regulations affecting subsidiary bank dividends paid to the Company, the Company’s earnings, financial condition and cash flows, and cash dividends declared and paid on common stock. 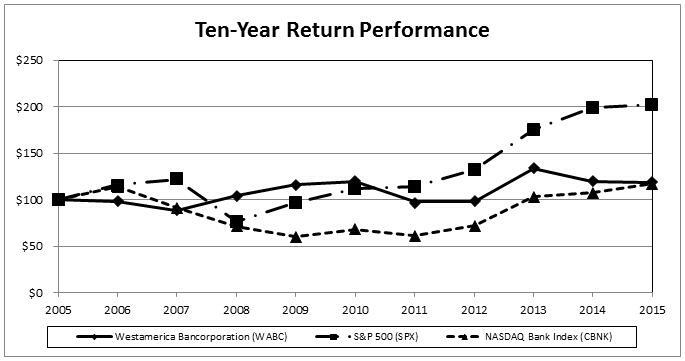 The following chart compares the cumulative return on the Company’s stock during the ten years ended December 31, 2015 with the cumulative return on the S&P 500 composite stock index and NASDAQ’S Bank Index. The comparison assumes $100 invested in each on December 31, 2005 and reinvestment of all dividends. 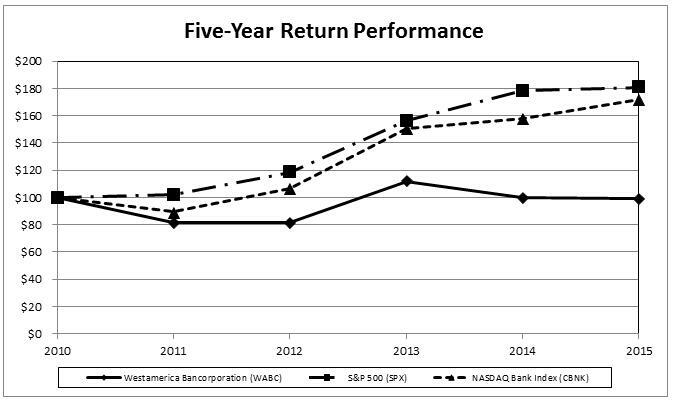 The following chart compares the cumulative return on the Company’s stock during the five years ended December 31, 2015 with the cumulative return on the S&P 500 composite stock index and NASDAQ’S Bank Index. The comparison assumes $100 invested in each on December 31, 2010 and reinvestment of all dividends. The table below sets forth the information with respect to purchases made by or on behalf of Westamerica Bancorporation or any “affiliated purchaser” (as defined in Rule 10b-18(a)(3) under the Securities Exchange Act of 1934), of common stock during the quarter ended December 31, 2015 (in thousands, except per share data). * No shares were purchased during the fourth quarter 2015 by the Company in private transactions with the independent administrator of the Company’s Tax Deferred Savings/Retirement Plan (ESOP). The Company includes the shares purchased in such transactions within the total number of shares authorized for purchase pursuant to the currently existing publicly announced program. The Company repurchases shares of its common stock in the open market to optimize the Company’s use of equity capital and enhance shareholder value and with the intention of lessening the dilutive impact of issuing new shares under stock option plans, and other ongoing requirements. Shares were repurchased during the fourth quarter 2015 pursuant to a program approved by the Board of Directors on July 23, 2015 authorizing the purchase of up to 1,750 thousand shares of the Company’s common stock from time to time prior to September 1, 2016. The following financial information for the five years ended December 31, 2015 has been derived from the Company’s audited consolidated financial statements. This information should be read in conjunction with those statements, notes and other information included elsewhere herein. (1) Yields on securities and certain loans have been adjusted upward to a "fully taxable equivalent" ("FTE") basis, which is a non-GAAP financial measure, in order to reflect the effect of income which is exempt from federal income taxation at the current statutory tax rate. (2) The efficiency ratio is defined as noninterest expense divided by total revenue (net interest income on an FTE basis, which is a non-GAAP financial measure, and noninterest income). The following discussion addresses information pertaining to the financial condition and results of operations of Westamerica Bancorporation and subsidiaries (the “Company”) that may not be otherwise apparent from a review of the consolidated financial statements and related footnotes. It should be read in conjunction with those statements and notes found on pages 48 through 89, as well as with the other information presented throughout this Report. The Company’s consolidated financial statements are prepared in accordance with accounting principles generally accepted in the United States of America and follow general practices within the banking industry. Application of these principles requires the Company to make certain estimates, assumptions, and judgments that affect the amounts reported in the financial statements and accompanying notes. These estimates, assumptions, and judgments are based on information available as of the date of the financial statements; accordingly, as this information changes, the financial statements could reflect different estimates, assumptions, and judgments. Certain accounting policies inherently have a greater reliance on the use of estimates, assumptions and judgments and as such have a greater possibility of producing results that could be materially different than originally reported. Estimates, assumptions and judgments are necessary when assets and liabilities are required to be recorded at fair value, when a decline in the value of an asset not carried on the financial statements at fair value warrants an impairment writedown or valuation reserve to be established, or when an asset or liability needs to be recorded contingent upon a future event. Carrying assets and liabilities at fair value inherently results in more financial statement volatility. The fair values and the information used to record valuation adjustments for certain assets and liabilities are based either on quoted market prices or are provided by other third-party sources, when available. The most significant accounting policies followed by the Company are presented in Note 1 to the consolidated financial statements. These policies, along with the disclosures presented in the other financial statement notes and in this discussion, provide information on how significant assets and liabilities are valued in the financial statements and how those values are determined. Based on the valuation techniques used and the sensitivity of financial statement amounts to the methods, assumptions, and estimates underlying those amounts, Management has identified the allowance for loan losses accounting to be the accounting area requiring the most subjective or complex judgments, and as such could be most subject to revision as new information becomes available. A discussion of the factors affecting accounting for the allowance for loan losses and purchased loans is included in the “Loan Portfolio Credit Risk” discussion below. In response to the “great recession” of 2008 and early 2009, the Federal Reserve’s Federal Open Market Committee has maintained highly accommodative monetary policies to influence interest rates to low levels in order to provide stimulus to the economy following the “financial crisis” recession. The Company’s principal source of revenue is net interest income, which represents interest earned on loans and investment securities (“earning assets”) reduced by interest paid on deposits and other borrowings (“interest-bearing liabilities”). The relatively low level of market interest rates during the five years ended December 31, 2015 has reduced the spread between interest rates on earning assets and interest bearing liabilities. The Company’s net interest margin and net interest income declined as market interest rates on newly originated loans remain below the yields earned on older-dated loans and on the overall loan portfolio. The Company has been reducing its exposure to rising interest rates by purchasing shorter-duration investment securities with lower yields than longer-duration securities. The Company’s credit quality continued to improve, as nonperforming loans at December 31, 2015 declined 15.5 percent compared with December 31, 2014 and net loan losses have also declined from $3.0 million in 2014 to $1.7 million in 2015. The improvement in credit quality has resulted in Management reducing the provision for loan losses to zero in 2015 from $2.8 million in 2014 and $8.0 million in 2013. Management is focused on controlling all noninterest expense levels, particularly due to market interest rate pressure on net interest income. The Company reported net income of $58.8 million or $2.30 diluted earnings per common share for the year ended December 31, 2015 compared with net income of $60.6 million or $2.32 diluted earnings per common share for the year ended December 31, 2014 and net income of $67.2 million or $2.50 diluted earnings per common share for the year ended December 31, 2013. Comparing 2015 with 2014, net income decreased $1.9 million or 3.1%, primarily due to lower net interest and loan fee income (FTE) and lower noninterest income, partially offset by decreases in loan loss provision, noninterest expense and income tax provision (FTE). The lower net interest and loan fee income (FTE) was primarily caused by a lower average volume of loans and lower yields on interest-earning assets, partially offset by higher average balances of investments and lower average balances of higher-costing interest-bearing liabilities. The provision for loan losses was reduced, reflecting Management's evaluation of losses inherent in the loan portfolio; net loan losses and nonperforming loan volumes have declined relative to earlier periods. Lower noninterest income was mostly attributable to lower merchant processing service fees and lower service charges on deposit accounts. Noninterest expense decreased primarily due to reduced personnel costs and other operational expenses. Comparing 2014 with 2013, net income decreased $6.5 million primarily due to lower net interest and fee income (FTE) and lower noninterest income, partially offset by decreases in the provision for loan losses, noninterest expense and income tax provision (FTE). The lower net interest and fee income (FTE) was primarily caused by a lower average volume of loans and lower yields on interest earning assets, partially offset by higher average balances of investments and lower average balances of higher-costing interest-bearing liabilities. The provision for loan losses was reduced, reflecting Management's evaluation of losses inherent in the loan portfolio. Lower noninterest income was mostly attributable to lower merchant processing service fees and lower service charges on deposit accounts. Noninterest expense decreased mostly due to reduced OREO expense net of disposition gains, lower personnel costs and other operational expenses. The Company's primary source of revenue is net interest income, or the difference between interest income earned on loans and investment securities and interest expense paid on interest-bearing deposits and other borrowings. Comparing 2015 with 2014, net interest and fee income (FTE) decreased $4.4 million or 2.9% primarily due to a lower average volume of loans (down $155 million) and lower yields on interest-earning assets (FTE) (down 37 basis points “bp”), partially offset by higher average balances of investments (up $436 million) and lower average balances of higher-costing interest-bearing liabilities. Comparing 2014 with 2013, net interest and fee income (FTE) decreased $15.1 million or 9.0% primarily due to a lower average volume of loans (down $182 million) and lower yields on interest-earning assets (FTE) (down 41 basis points “bp”), partially offset by higher average balances of investments (up $206 million) and lower average balances of higher-costing interest-bearing liabilities. Loan volumes have declined due to problem loan workout activities (such as chargeoffs, collateral repossessions and principal payments), particularly with purchased loans, and reduced volumes of loan originations. In Management’s opinion, current levels of competitive loan pricing do not provide adequate forward earnings potential. As a result, the Company has not currently taken an aggressive posture relative to loan portfolio growth. Management has maintained relatively stable interest-earning asset volumes by increasing investment securities as loan volumes have declined. Yields on interest-earning assets have declined due to relatively low interest rates prevailing in the market. The net interest margin (FTE) was 3.36% in 2015, 3.70% in 2014 and 4.08% in 2013. During the three years ended December 31, 2015, the net interest margin (FTE) was affected by declining market interest rates. The volume of older-dated higher-yielding loans declined due to principal maturities and paydowns. Newly originated loans have lower yields. The Company, in anticipation of rising interest rates, has been purchasing floating rate and shorter-duration investment securities with lower yields than longer-duration securities to increase liquidity. The Company’s high levels of liquidity will provide an opportunity to obtain higher yielding assets assuming market interest rates start rising. The Company has been purchasing securities of U. S. government sponsored entities which have call options; the issuing entities have been exercising the call options, and the Company has re-invested the proceeds at prevailing market rates; interest rates in the two to five-year time horizon were volatile throughout 2015 providing some opportunity to re-invest cash flows at higher yields. The Company has been replacing higher-cost funding sources with low-cost deposits and interest expense has declined to offset some of the decline in interest income. Interest expense has been reduced by lowering rates paid on interest-bearing deposits and borrowings and by reducing the volume of higher-cost funding sources. A $15 million long-term note was repaid in October 2013 and a $10 million term repurchase agreement was repaid in August 2014. Federal Home Loan Bank (“FHLB”) advances were repaid in January 2015. Average balances of time deposits declined $100 million in 2015 compared with 2014. Lower-cost checking and savings deposits accounted for 92.5% of total average deposits in 2015 compared with 89.8% in 2014 and 86.3% in 2013. The following tables present information regarding the consolidated average assets, liabilities and shareholders’ equity, the amounts of interest income earned from average interest earning assets and the resulting yields, and the amounts of interest expense incurred on average interest-bearing liabilities and the resulting rates. Average loan balances include nonperforming loans. Interest income includes reversal of previously accrued interest on loans placed on non-accrual status during the period and proceeds from loans on nonaccrual status only to the extent cash payments have been received and applied as interest income and accretion of purchased loan discounts. Yields on tax-exempt securities and loans have been adjusted upward to reflect the effect of income exempt from federal income taxation at the current statutory tax rate. (1) Amounts calculated on a fully taxable equivalent basis using the current statutory federal tax rate. (2) Net interest spread represents the average yield earned on interest-earning assets less the average rate incurred on interest-bearing liabilities. (3) Net interest margin is computed by calculating the difference between interest income and expense, divided by the average balance of interest-earning assets. The net interest margin is greater than the net interest spread due to the benefit of noninterest-bearing demand deposits. The following tables set forth a summary of the changes in interest income and interest expense due to changes in average assets and liability balances (volume) and changes in average interest yields/rates for the periods indicated. Changes not solely attributable to volume or yields/rates have been allocated in proportion to the respective volume and yield/rate components. The Company manages credit costs by consistently enforcing conservative underwriting and administration procedures and aggressively pursuing collection efforts with debtors experiencing financial difficulties. The provision for loan losses reflects Management's assessment of credit risk in the loan portfolio during each of the periods presented. The Company provided no provision for loan losses in 2015 compared with $2.8 million in 2014 and $8.0 million in 2013. The provision for loan losses is determined based on Management’s evaluation of credit quality for the loan portfolio. The reduction in the provision for loan losses in 2015 and 2014 reflects the decline in net losses and nonperforming loan volumes during the periods relative to earlier periods. The Company recorded purchased County Bank and Sonoma Valley Bank loans at estimated fair value upon the acquisition dates, February 6, 2009 and August 20, 2010, respectively. Such estimated fair values were recognized for individual loans, although small balance homogenous loans were pooled for valuation purposes. The valuation discounts recorded for purchased loans included Management’s assessment of the risk of principal loss under economic and borrower conditions prevailing on the dates of purchase. The purchased County Bank loans secured by single-family residential real estate are “covered” through February 6, 2019 by loss-sharing agreements the Company entered with the FDIC which mitigates losses during the term of the agreements. The FDIC indemnification of purchased County Bank non-single-family residential secured loans expired February 6, 2014. Any deterioration in estimated value related to principal loss subsequent to the acquisition dates requires additional loss recognition through a provision for loan losses. No assurance can be given future provisions for loan losses related to purchased loans will not be necessary. For further information regarding credit risk, the FDIC loss-sharing agreements, net credit losses and the allowance for loan losses, see the “Loan Portfolio Credit Risk” and “Allowance for Loan Losses” sections of this report. In 2015, noninterest income decreased $3.9 million or 7.6% compared with 2014. Service charges on deposits decreased $2.0 million compared with 2014 due to declines in fees charged on overdrawn and insufficient funds accounts (down $913 thousand), lower fees on analyzed accounts (down $661 thousand) and lower activity on checking accounts (down $325 thousand). Merchant processing services declined $880 thousand primarily due to lower transaction volumes. In 2014, noninterest income decreased $5.2 million or 9.2% compared with 2013. Merchant processing services fees decreased $1.8 million primarily due to lower transaction volumes. Service charges on deposits decreased $1.5 million compared with 2013 primarily due to declines in fees charged on overdrawn and insufficient funds accounts (down $1.0 million) and lower activity on checking accounts (down $410 thousand). ATM processing fees decreased $285 thousand mainly because the Bank customers had fewer transactions at non-Westamerica ATMs and other cash dispensing terminals. Other noninterest income decreased $1.8 million primarily due to the recognition in 2013 of a loan principal recovery exceeding the purchase date fair value. Trust fees increased $269 thousand mostly due to marketing efforts to increase customer accounts and higher court-approved fees. Debit card fees increased $131 thousand primarily due to higher transaction volumes. In 2015, noninterest expense decreased $1.5 million or 1.4% compared with 2014 primarily due to decreases in personnel costs and other operational expenses. Salaries and related benefits decreased $2.6 million primarily due to employee attrition. Amortization of identifiable intangibles decreased as assets are amortized on a declining balance method. Courier expense decreased primarily due to consolidating service runs. OREO expense in 2015 included net writedowns while in 2014 the Company realized net gains on disposition of foreclosed assets. Furniture and equipment expense increased primarily due to higher depreciation costs resulting from computer and software upgrades and higher software license fees. In 2014, noninterest expense decreased $5.8 million or 5.2% compared with 2013. Salaries and related benefits decreased $1.9 million primarily due to employee attrition. Expenses for other real estate owned, net of disposition gains, declined $1.7 million due to higher net gains on sale of repossessed loan collateral. Professional fees declined $711 thousand due to lower legal fees associated with nonperforming assets. Amortization of identifiable intangibles decreased $434 thousand as assets are amortized on a declining balance method. Other noninterest expense decreased $916 thousand primarily due to lower loan administration costs and lower limited partnership operating losses. Furniture and equipment expenses increased $305 thousand primarily due to increased depreciation costs associated with computer system and software upgrades. The income tax provision (FTE) was $32.1 million in 2015 compared with $34.2 million in 2014 and $37.0 million in 2013. The 2015 effective tax rate (FTE) was 35.3% compared with 36.1% in 2014 and 35.5% in 2013. The effective tax rates without FTE adjustments were 23.4% for 2015 and 23.2% for 2014 and 22.0% for 2013. The 2015 tax provision included adjustments based on filing the 2014 federal and state tax returns and tax benefits from completing audits with the California Franchise Tax Board and recognizing California enterprise zone hiring credits for filed amended returns (2010). The 2014 tax provision reflected an adjustment based on filing 2013 federal tax return and tax benefits from completing audits with the California Franchise Tax Board. Effective January 1, 2014, the new legislation signed by California’s Governor Jerry Brown eliminated the net interest deduction for enterprise zone loans and the hiring credits were significantly altered. The Company did not incur a significant change in its tax provision due to the new laws; the state tax benefits recognized from the current enterprise zone tax incentive program for the years ended December 31, 2014 and 2013 were $47 thousand and $121 thousand, net of federal income tax consequences, respectively. The Company maintains a securities portfolio consisting of securities issued by U.S. Treasury, U.S. Government sponsored entities, agency and non-agency mortgage backed securities, state and political subdivisions, corporations, and asset-backed and other securities. Investment securities are held in safekeeping by an independent custodian. Management has increased the investment portfolio in response to deposit growth and loan volume declines. The carrying value of the Company’s investment securities portfolio was $2.9 billion as of December 31, 2015, an increase of $247 million compared to December 31, 2014. Management continually evaluates the Company’s investment securities portfolio in response to established asset/liability management objectives, changing market conditions that could affect profitability, liquidity, and the level of interest rate risk to which the Company is exposed. These evaluations may cause Management to change the level of funds the Company deploys into investment securities, change the composition of the Company’s investment securities portfolio, and change the proportion of investments allocated into the available for sale and held to maturity investment categories. The Company’s positioning of the balance sheet for rising interest rates has resulted in the purchase of floating rate corporate bonds, federal agency bonds, mortgage-backed securities, and short-term state and municipal bonds. As of December 31, 2015, substantially all of the Company’s investment securities continue to be investment grade rated by one or more major rating agencies. In addition to monitoring credit rating agency evaluations, Management performs its own evaluations regarding the credit worthiness of the issuer or the securitized assets underlying asset-backed securities. The Company’s procedures for evaluating investments in securities are in accordance with guidance issued by the Board of Governors of the Federal Reserve System, “Investing in Securities without Reliance on Nationally Recognized Statistical Rating Agencies” (SR 12-15) and other regulatory guidance. Credit ratings are considered in our analysis only as a guide to the historical default rate associated with similarly-rated bonds. There have been no significant differences in our internal analyses compared with the ratings assigned by the third party credit rating agencies. The following table sets forth the relative maturities and contractual yields of the Company’s available for sale securities (stated at fair value) at December 31, 2015. Yields on state and political subdivision securities have been calculated on a fully taxable equivalent basis using the current federal statutory rate. Mortgage-backed securities are shown separately because they are typically paid in monthly installments over a number of years. The following table sets forth the relative maturities and contractual yields of the Company’s held to maturity securities at December 31, 2015. Yields on state and political subdivision securities have been calculated on a fully taxable equivalent basis using the current federal statutory rate. Mortgage-backed securities are shown separately because they are typically paid in monthly installments over a number of years. The following tables summarize the total general obligation and revenue bonds issued by states and political subdivisions held in the Company’s investment securities portfolios as of the dates indicated, identifying the state in which the issuing government municipality or agency operates. At December 31, 2015, the Company’s investment securities portfolios included securities issued by 725 state and local government municipalities and agencies located within 44 states with a fair value of $864.2 million. None of the Company’s investment securities were issued by Puerto Rican government entities. The largest exposure to any one municipality or agency was $10.3 million (fair value) represented by nine general obligation bonds. At December 31, 2014, the Company’s investment securities portfolios included securities issued by 763 state and local government municipalities and agencies located within 45 states with a fair value of $911.0 million. The largest exposure to any one municipality or agency was $7.4 million (fair value) represented by three revenue bonds. At December 31, 2015, the revenue bonds in the Company’s investment securities portfolios were issued by state and local government municipalities and agencies to fund public services such as water utility, sewer utility, recreational and school facilities, and general public and economic improvements. The revenue bonds were payable from 22 revenue sources. The revenue sources that represent 5% or more individually of the total revenue bonds are summarized in the following table. At December 31, 2014, the revenue bonds in the Company’s investment securities portfolios were issued by state and local government municipalities and agencies to fund public services such as water utility, sewer utility, recreational and school facilities, and general public and economic improvements. The revenue bonds were payable from 25 revenue sources. The revenue sources that represent 5% or more individually of the total revenue bonds are summarized in the following table. See Note 2 to the consolidated financial statements for additional information related to the investment securities. The Company originates loans with the intent to hold such assets until principal is repaid. Management follows written loan underwriting policies and procedures which are approved by the Bank’s Board of Directors. Loans are underwritten following approved underwriting standards and lending authorities within a formalized organizational structure. The Board of Directors also approves independent real estate appraisers to be used in obtaining estimated values for real property serving as loan collateral. Prevailing economic trends and conditions are also taken into consideration in loan underwriting practices. All loan applications must be for clearly defined legitimate purposes with a determinable primary source of repayment, and as appropriate, secondary sources of repayment. All loans are supported by appropriate documentation such as current financial statements, tax returns, credit reports, collateral information, guarantor asset verification, title reports, appraisals, and other relevant documentation. Commercial loans represent term loans used to acquire durable business assets or revolving lines of credit used to finance working capital. Underwriting practices evaluate each borrower’s cash flow as the principal source of loan repayment. Commercial loans are generally secured by the borrower’s business assets as a secondary source of repayment. Commercial loans are evaluated for credit-worthiness based on prior loan performance, borrower financial information including cash flow, borrower net worth and aggregate debt. Commercial real estate loans represent term loans used to acquire real estate to be operated by the borrower in a commercial capacity. Underwriting practices evaluate each borrower’s global cash flow as the principal source of loan repayment, independent appraisal of value of the property, and other relevant factors. Commercial real estate loans are generally secured by a first lien on the property as a secondary source of repayment. Real estate construction loans represent the financing of real estate development. Loan principal disbursements are controlled through the use of project budgets, and disbursements are approved based on construction progress, which is validated by project site inspections. The real estate serves as collateral, secured by a first lien position on the property. Residential real estate loans generally represent first lien mortgages used by the borrower to purchase or refinance a principal residence. For interest-rate risk purposes, the Company offers only fully-amortizing, adjustable-rate mortgages. In underwriting first lien mortgages, the Company evaluates each borrower’s ability to repay the loan, an independent appraisal of the value of the property, and other relevant factors. The Company does not offer riskier mortgage products, such as non-amortizing “interest-only” mortgages and “negative amortization” mortgages. For loans secured by real estate, the Bank requires title insurance to insure the status of its lien and each borrower is obligated to insure the real estate collateral, naming the Company as loss payee, in an amount sufficient to repay the principal amount outstanding in the event of a property casualty loss. Consumer installment and other loans are predominantly comprised of indirect automobile loans with underwriting based on credit history and scores, personal income, debt service capacity, and collateral values. For management purposes, the Company segregates its loan portfolio into three segments. Loans originated by the Company following its loan underwriting policies and procedures are separated from loans purchased from the FDIC. Loan volumes have declined due to problem loan workout activities, particularly with purchased loans, and reduced volumes of loan originations. In Management’s opinion, current levels of competitive loan pricing do not provide adequate forward earnings potential. As a result, the Company has not currently taken an aggressive posture relative to loan portfolio growth. The following table shows the maturity distribution and interest rate sensitivity of commercial, commercial real estate, and construction loans at December 31, 2015. Balances exclude residential real estate loans and consumer loans totaling $509.2 million. These types of loans are typically paid in monthly installments over a number of years. The Company issues formal commitments on lines of credit to well-established and financially responsible commercial enterprises. Such commitments can be either secured or unsecured and are typically in the form of revolving lines of credit for seasonal working capital needs. Occasionally, such commitments are in the form of letters of credit to facilitate the customers’ particular business transactions. Commitment fees are generally charged for commitments and letters of credit. Commitments on lines of credit and letters of credit typically mature within one year. For further information, see the accompanying notes to the consolidated financial statements. The Company extends loans to commercial and consumer customers which expose the Company to the risk borrowers will default, causing loan losses. The Company’s lending activities are exposed to various qualitative risks. All loan segments are exposed to risks inherent in the economy and market conditions. Significant risk characteristics related to the commercial loan segment include the borrowers’ business performance and financial condition, and the value of collateral for secured loans. Significant risk characteristics related to the commercial real estate segment include the borrowers’ business performance and the value of properties collateralizing the loans. Significant risk characteristics related to the construction loan segment include the borrowers’ performance in successfully developing the real estate into the intended purpose and the value of the property collateralizing the loans. Significant risk characteristics related to the residential real estate segment include the borrowers’ financial wherewithal to service the mortgages and the value of the property collateralizing the loans. Significant risk characteristics related to the consumer loan segment include the financial condition of the borrowers and the value of collateral securing the loans. The preparation of the financial statements requires Management to estimate the amount of losses inherent in the loan portfolio and establish an allowance for credit losses. The allowance for credit losses is established by assessing a provision for loan losses against the Company’s earnings. In estimating credit losses, Management must exercise judgment in evaluating information deemed relevant, such as financial information regarding individual borrowers, overall credit loss experience, the amount of past due, nonperforming and classified loans, recommendations of regulatory authorities, prevailing economic conditions and other information. The amount of ultimate losses on the loan portfolio can vary from the estimated amounts. Management follows a systematic methodology to estimate loss potential in an effort to reduce the differences between estimated and actual losses. The Company closely monitors the markets in which it conducts its lending operations and follows a strategy to control exposure to loans with high credit risk. The Bank’s organization structure separates the functions of business development and loan underwriting; Management believes this segregation of duties avoids inherent conflicts of combining business development and loan approval functions. In measuring and managing credit risk, the Company adheres to the following practices. · The Bank maintains a Loan Review Department which reports directly to the Board of Directors. The Loan Review Department performs independent evaluations of loans and assigns credit risk grades to evaluated loans using grading standards employed by bank regulatory agencies. Those loans judged to carry higher risk attributes are referred to as “classified loans.” Classified loans receive elevated management attention to maximize collection. · The Bank maintains two loan administration offices whose sole responsibility is to manage and collect classified loans. Classified loans with higher levels of credit risk are further designated as “nonaccrual loans.” Management places classified loans on nonaccrual status when full collection of contractual interest and principal payments is in doubt. Uncollected interest previously accrued on loans placed on nonaccrual status is reversed as a charge against interest income. The Company does not accrue interest income on loans following placement on nonaccrual status. Interest payments received on nonaccrual loans are applied to reduce the carrying amount of the loan unless the carrying amount is well secured by loan collateral. “Nonperforming assets” include nonaccrual loans, loans 90 or more days past due and still accruing, and repossessed loan collateral (commonly referred to as “Other Real Estate Owned”). The former County Bank loans and repossessed loan collateral were purchased from the FDIC with indemnifying loss-sharing agreements. The loss-sharing agreement on single-family residential real estate assets expires February 6, 2019. The loss-sharing agreement on non-single-family residential real estate assets expired February 6, 2014 as to losses and expires February 6, 2017 as to loss recoveries. At December 31, 2015, two loans secured by commercial real estate totaling $10,990 thousand were on nonaccrual status. The remaining sixteen nonaccrual loans held at December 31, 2015 had an average carrying value of $251 thousand and the largest carrying value was $1,323 thousand. Management believes the overall credit quality of the loan portfolio is reasonably stable; however, classified and nonperforming assets could fluctuate from period to period. The performance of any individual loan can be affected by external factors such as the interest rate environment, economic conditions, and collateral values or factors particular to the borrower. No assurance can be given that additional increases in nonaccrual and delinquent loans will not occur in the future. The Company’s allowance for loan losses represents Management’s estimate of loan losses inherent in the loan portfolio. In evaluating credit risk for loans, Management measures loss potential of the carrying value of loans. As described above, payments received on nonaccrual loans may be applied against the principal balance of the loans until such time as full collection of the remaining recorded balance is expected. Further, the carrying value of purchased loans includes fair value discounts assigned at the time of purchase under the provisions of FASB ASC 805, Business Combinations, and FASB ASC 310-30, Loans or Debt Securities with Deteriorated Credit Quality. The allowance for loan losses represents Management’s estimate of loan losses in excess of these reductions to the carrying value of loans within the loan portfolio. The Company's allowance for loan losses is maintained at a level considered appropriate to provide for losses that can be estimated based upon specific and general conditions. These include conditions unique to individual borrowers, as well as overall loan loss experience, the amount of past due, nonperforming and classified loans, the amount of non-indemnified purchased loans, recommendations of regulatory authorities, prevailing economic conditions and other factors. A portion of the allowance is individually allocated to impaired loans whose full collectability of principal is uncertain. Such allocations are determined by Management based on loan-by-loan analyses. The Company evaluates all loans with outstanding principal balances in excess of $500 thousand which are classified or on nonaccrual status and all “troubled debt restructured” loans for impairment. The remainder of the loan portfolio is collectively evaluated for impairment based in part on quantitative analyses of historical loan loss experience of loan portfolio segments to determine standard loss rates for each segment. The loss rate for each loan portfolio segment reflects both the historical loss experience during a look-back period and the loss emergence period. During 2014, the Company refined its processes used to measure look-back periods and loss emergence periods. The loss rates are applied to segmented loan balances to allocate the allowance to the segments of the loan portfolio. Purchased loans were recorded on the date of purchase at estimated fair value; fair value discounts include a component for estimated loan losses. The Company evaluates all nonaccrual purchased loans with outstanding principal balances in excess of $500 thousand for impairment; the impaired loan value is compared to the recorded investment in the loan, which has been reduced by the loan default discount estimated on the date of purchase. If Management’s impairment analysis determines the impaired loan value is less than the recorded investment in the purchased loan, an allocation of the allowance for loan losses is established for the deficiency. For all other purchased loan portfolio segments, Management applies the standard loss rates to the purchased loan portfolio segments to determine initial allocations of the allowance. Further, liquidating purchased consumer installment loans are evaluated separately by applying historical loss rates to forecasted liquidating principal balances to initially measure losses inherent in this portfolio segment. The initial allocations of the allowance to purchased loan portfolio segments are compared to loan default discounts ascribed to each segment. Management establishes allocations of the allowance for loan losses for any estimated deficiency. The remainder of the allowance is considered to be unallocated. The unallocated allowance is established to provide for probable losses that have been incurred as of the reporting date but not reflected in the allocated allowance. The unallocated allowance addresses additional qualitative factors consistent with Management's analysis of the level of risks inherent in the loan portfolio, which are related to the risks of the Company's general lending activity. Included in the unallocated allowance is the risk of losses that are attributable to national or local economic or industry trends which have occurred but have not yet been recognized in loan chargeoff history (external factors). The primary external factor evaluated by the Company and the judgmental amount of unallocated reserve assigned by Management as of December 31, 2015 are economic and business conditions $1.0 million. Also included in the unallocated allowance is the risk of losses attributable to general attributes of the Company's loan portfolio and credit administration (internal factors). The internal factors evaluated by the Company and the judgmental amount of unallocated reserve assigned by Management are: loan review system $1.2 million, adequacy of lending Management and staff $1.3 million, concentrations of credit $2.5 million, and other factors. The Company allocated more allowance for loan losses to the commercial loan category at December 31, 2015, due to more reserve being allocated to individually evaluated loans. At December r31, 2015, the decline in the unallocated was generally due to the overall improved credit quality metrics. Management considers the $29.8 million allowance for loan losses to be adequate as a reserve against loan losses inherent in the loan portfolio as of December 31, 2015. See Note 3 to the consolidated financial statements for additional information related to the loan portfolio, loan portfolio credit risk, and allowance for loan losses. Asset/liability management involves the evaluation, monitoring and management of interest rate risk, market risk, liquidity and funding. The fundamental objective of the Company's management of assets and liabilities is to maximize its economic value while maintaining adequate liquidity and a conservative level of interest rate risk. Interest rate risk is a significant market risk affecting the Company. Many factors affect the Company’s exposure to interest rates, such as general economic and financial conditions, customer preferences, historical pricing relationships, and re-pricing characteristics of financial instruments. Assets and liabilities may mature or re-price at different times. Assets and liabilities may re-price at the same time but by different amounts. Short-term and long-term market interest rates may change by different amounts. The timing and amount of cash flows of various assets or liabilities may shorten or lengthen as interest rates change. In addition, the changing levels of interest rates may have an impact on loan demand, demand for various deposit products, credit losses, and other elements of earnings such as account analysis fees on commercial deposit accounts and correspondent bank service charges. The Company’s earnings are affected not only by general economic conditions, but also by the monetary and fiscal policies of the U.S. and its agencies, particularly the Federal Reserve Board (the “FRB”). The monetary policies of the FRB can influence the overall growth of loans, investment securities, and deposits and the level of interest rates earned on assets and paid for liabilities. The nature and impact of future changes in monetary policies are generally not predictable. The Federal Open Market Committee (“FOMC”) increased the target range for the federal funds rate to 1/4 to 1/2 percent on December 16, 2015. Interest rates on United States Treasury obligations declined from January 1, 2016 through January 27, 2016. The FOMC’s January 27, 2016 press release stated “Information received since the Federal Open Market Committee met in December suggests that labor market conditions improved further even as economic growth slowed late last year…Market-based measures of inflation compensation declined further; survey-based measures of longer-term inflation expectations are little changed, on balance, in recent months…The Committee is closely monitoring global economic and financial developments and is assessing their implications for the labor market and inflation, and for the balance of risks to the outlook…Given the economic outlook, the Committee decided to maintain the target range for the federal funds rate at 1/4 to 1/2 percent. The stance of monetary policy remains accommodative, thereby supporting further improvement in labor market conditions and a return to 2 percent inflation. In determining the timing and size of future adjustments to the target range for the federal funds rate, the Committee will assess realized and expected economic conditions relative to its objectives of maximum employment and 2 percent inflation.” In this context, Management expects a high level of uncertainty in regard to interest rate levels in the immediate term, and Management’s most likely earnings forecast for the twelve months ending December 31, 2016 assumes market interest rates will either remain at relatively low levels or short-term rates will rise gradually. In adjusting the Company's asset/liability position, Management attempts to manage interest rate risk while enhancing the net interest margin and net interest income. At times, depending on expected increases or decreases in general interest rates, the relationship between long and short-term interest rates, market conditions and competitive factors, Management may adjust the Company's interest rate risk position in order to manage its net interest margin and net interest income. The Company's results of operations and net portfolio values remain subject to changes in interest rates and to fluctuations in the difference between long and short-term interest rates. The Company’s asset and liability position was slightly “asset sensitive” at December 31, 2015, depending on the interest rate assumptions applied to the simulation model employed by Management to measure interest rate risk. An “asset sensitive” position results in a slightly larger change in interest income than in interest expense resulting from application of assumed interest rate changes. Simulation estimates depend on, and will change with, the size and mix of the actual and projected balance sheet at the time of each simulation. Management’s interest rate risk management is currently biased toward stable or gradually increasing interest rates in the near-term and intermediate term. Management continues to monitor the interest rate environment as well as economic conditions and other factors it deems relevant in managing the Company's exposure to interest rate risk. The Company does not currently engage in trading activities or use derivative instruments to control interest rate risk, even though such activities may be permitted with the approval of the Company's Board of Directors. Equity price risk can affect the Company. As an example, any preferred or common stock holdings, as permitted by banking regulations, can fluctuate in value. Management regularly assesses the extent and duration of any declines in market value, the causes of such declines, the likelihood of a recovery in market value, and its intent to hold securities until a recovery in value occurs. Declines in value of preferred or common stock holdings that are deemed “other than temporary” could result in loss recognition in the Company's income statement. Fluctuations in the Company's common stock price can impact the Company's financial results in several ways. First, the Company has regularly repurchased and retired its common stock; the market price paid to retire the Company's common stock can affect the level of the Company's shareholders' equity, cash flows and shares outstanding. Second, the Company's common stock price impacts the number of dilutive equivalent shares used to compute diluted earnings per share. Third, fluctuations in the Company's common stock price can motivate holders of options to purchase Company common stock through the exercise of such options thereby increasing the number of shares outstanding. Finally, the amount of compensation expense associated with share based compensation fluctuates with changes in and the volatility of the Company's common stock price. Market values of loan collateral can directly impact the level of loan chargeoffs and the provision for loan losses. The financial condition and liquidity of debtors issuing bonds and debtors whose mortgages or other obligations are securitized can directly impact the credit quality of the Company’s investment portfolio requiring the Company to recognize other than temporary impairment charges. Other types of market risk, such as foreign currency exchange risk and commodity price risk, are not significant in the normal course of the Company's business activities. The objective of liquidity management is to manage cash flow and liquidity reserves so that they are adequate to fund the Company's operations and meet obligations and other commitments on a timely basis and at a reasonable cost. The Company achieves this objective through the selection of asset and liability maturity mixes that it believes best meet its needs. The Company's liquidity position is enhanced by its ability to raise additional funds as needed in the wholesale markets. In recent years, the Company's deposit base has provided the majority of the Company's funding requirements. This relatively stable and low-cost source of funds, along with shareholders' equity, provided 97 percent of funding for average total assets in 2015 and 2014. The stability of the Company’s funding from customer deposits is in part reliant on the confidence clients have in the Company. The Company places a very high priority in maintaining this confidence through conservative credit and capital management practices and by maintaining an appropriate level of liquidity reserves. Liquidity is further provided by assets such as balances held at the Federal Reserve Bank, investment securities, and amortizing loans. The Company's investment securities portfolio provides a substantial secondary liquidity reserve. The Company held $2.9 billion in total investment securities at December 31, 2015. Under certain deposit, borrowing and other arrangements, the Company must hold and pledge investment securities as collateral. At December 31, 2015, such collateral requirements totaled approximately $739 million. Liquidity risk can result from the mismatching of asset and liability cash flows, or from disruptions in the financial markets. The Company performs liquidity stress tests on a periodic basis to evaluate the sustainability of its liquidity. Under the stress testing, the Company assumes outflows of funds increase beyond expected levels. Measurement of such heightened outflows considers the composition of the Company’s deposit base, including any concentration of deposits, non-deposit funding such as short-term borrowings, and unfunded lending commitments. The Company evaluates its stock of highly liquid assets to meet the assumed higher levels of outflows. Highly liquid assets include cash and amounts due from other banks from daily transaction settlements, reduced by branch cash needs and Federal Reserve Bank reserve requirements, and investment securities based on regulatory risk-weighting guidelines. Based on the results of the most recent liquidity stress test, Management is satisfied with the liquidity condition of the Bank and the Company. However, no assurance can be given the Bank or Company will not experience a period of reduced liquidity. Management will monitor the Company’s cash levels throughout 2016. Loan demand from credit-worthy borrowers will be dictated by economic and competitive conditions. The Company aggressively solicits non-interest bearing demand deposits and money market checking deposits, which are the least sensitive to changes in interest rates. The growth of these deposit balances is subject to heightened competition, the success of the Company's sales efforts, delivery of superior customer service, new regulations and market conditions. The Company does not aggressively solicit higher-costing time deposits; as a result, Management anticipates such deposits will decline. Changes in interest rates, most notably rising interest rates, could impact deposit volumes. Depending on economic conditions, interest rate levels, and a variety of other conditions, deposit growth may be used to fund loans, reduce borrowings or purchase investment securities. However, due to possible volatility in economic conditions, competition and political uncertainty, loan demand and levels of customer deposits are not certain. Shareholder dividends are expected to continue subject to the Board's discretion and continuing evaluation of capital levels, earnings, asset quality and other factors. Westamerica Bancorporation ("Parent Company") is a separate entity apart from Westamerica Bank (“Bank”) and must provide for its own liquidity. In addition to its operating expenses, the Parent Company is responsible for the payment of dividends declared for its shareholders, and interest and principal on any outstanding debt. Substantially all of the Parent Company's revenues are obtained from subsidiary dividends and service fees. The Bank’s dividends paid to the Parent Company and proceeds from the exercise of stock options provided adequate cash flow for the Parent Company in 2015 and 2014 to pay shareholder dividends of $39 million and $40 million, respectively, and retire common stock in the amount of $15 million and $53 million, respectively. Payment of dividends to the Parent Company by the Bank is limited under California and Federal laws. The Company believes these regulatory dividend restrictions will not have an impact on the Parent Company's ability to meet its ongoing cash obligations. Operating lease obligations have not been reduced by minimum sublease rentals of $2 million due in the future under noncancelable subleases. Operating lease obligations may be retired prior to the contractual maturity as discussed in the notes to the consolidated financial statements. The purchase obligation consists of the Company’s minimum liabilities under contracts with third-party automation services providers . The Company has historically generated high levels of earnings, which provides a means of accumulating capital. The Company's net income as a percentage of average shareholders' equity (“return on equity” or “ROE”) has been 11.3% in 2015, 11.6% in 2014 and 12.5% in 2013. The Company also raises capital as employees exercise stock options. Capital raised through the exercise of stock options was $5 million in 2015 compared with $12 million in 2014 and $21 million in 2013. The Company paid common dividends totaling $39 million in 2015, $40 million in 2014 and $40 million in 2013, which represent dividends per common share of $1.53, $1.52 and $1.49, respectively. The Company's earnings have historically exceeded dividends paid to shareholders. The amount of earnings in excess of dividends provides the Company resources to finance growth and maintain appropriate levels of shareholders' equity. In the absence of profitable growth opportunities, the Company has repurchased and retired its common stock as another means to return earnings to shareholders. The Company repurchased and retired 344 thousand shares valued at $15 million in 2015, 1.0 million shares valued at $53 million in 2014 and 1.2 million shares valued at $57 million in 2013. The Company's primary capital resource is shareholders' equity, which was $532 million at December 31, 2015 compared with $527 million at December 31, 2014. The Company's ratio of equity to total assets was 10.30% at December 31, 2015 and 10.46% at December 31, 2014. The Company performs capital stress tests on a periodic basis to evaluate the sustainability of its capital. Under the stress testing, the Company assumes various scenarios such as deteriorating economic and operating conditions, unanticipated asset devaluations, and significant operational lapses. The Company measures the impact of these scenarios on its earnings and capital. Based on the results of the most recent stress tests, Management is satisfied with the capital condition of the Bank and the Company. However, no assurance can be given the Bank or Company will not experience a period of reduced earnings or a reduction in capital from unanticipated events and circumstances. · Established limits on the amount of deferred tax assets with any excess treated as a deduction from Tier 1 capital. Under the final rule, a banking organization that is not subject to the “advanced approaches rule” may make a one-time election not to include most elements of Accumulated Other Comprehensive Income, including net-of-tax unrealized gains and losses on available for sale investment securities, in regulatory capital. Neither the Company nor the Bank are subject to the “advanced approaches rule” and made the election not to include most elements of Accumulated Other Comprehensive Income in regulatory capital. Banking organizations that are not subject to the “advanced approaches rule” began complying with the final rule on January 1, 2015; on such date, the Company and the Bank became subject to the revised definitions of regulatory capital, the new minimum regulatory capital ratios, and various regulatory capital adjustments and deductions according to transition provisions and timelines. All banking organizations began calculating standardized total risk-weighted assets on January 1, 2015. The transition period for the capital conservation buffer for all banking organizations will begin on January 1, 2016 and end January 1, 2019. Any bank subject to the rule which is unable to maintain its “capital conservation buffer” will be restricted in the payment of discretionary executive compensation and shareholder distributions, such as dividends and share repurchases. The final rule did not supersede provisions of the Federal Deposit Insurance Corporation Improvement Act (FDICIA) requiring federal banking agencies to take prompt corrective action (PCA) to resolve problems of insured depository institutions. The final rule revised the PCA thresholds to incorporate the higher minimum levels of capital, including the newly proposed “common equity tier 1” ratio. The capital ratios for the Company and the Bank under the new capital framework are presented in the table below. (1) Includes 0.625% capital conservation buffer. (2) Includes 2.5% capital conservation buffer. The Company and the Bank intend to maintain regulatory capital in excess of the highest regulatory standard. The Company and the Bank routinely project capital levels by analyzing forecasted earnings, credit quality, securities valuations, shareholder dividends, asset volumes, share repurchase activity, stock option exercise proceeds, and other factors. Based on current capital projections, the Company and the Bank expect to maintain regulatory capital levels exceeding the highest effective regulatory standard and pay quarterly dividends to shareholders. No assurance can be given that changes in capital management plans will not occur. The Company primarily attracts deposits from local businesses and professionals, as well as through retail savings and checking accounts, and, to a more limited extent, certificates of deposit. (1) The rates for total deposits reflect value of noninterest-bearing deposits. The Company’s strategy includes building the value of its deposit base by building balances of lower-costing deposits and avoiding reliance on higher-costing time deposits. From 2013 to 2015 the deposit composition shifted from higher costing time deposits to lower costing checking and savings accounts. The Company’s average balances of checking and savings accounts represented 93% of average balances of total deposits in 2015 compared with 90% in 2014 and 86% in 2013. Total time deposits were $287 million and $385 million at December 31, 2015 and 2014, respectively. The following table sets forth, by time remaining to maturity, the Company’s total domestic time deposits. The Company has no foreign time deposits. The Company does not currently engage in trading activities or use derivative instruments to control interest rate risk, even though such activities may be permitted with the approval of the Company’s Board of Directors. Credit risk and interest rate risk are the most significant market risks affecting the Company, and equity price risk can also affect the Company’s financial results. These risks are described in the preceding sections regarding “Loan Portfolio Credit Risk,” and “Asset/Liability and Market Risk Management.” Other types of market risk, such as foreign currency exchange risk and commodity price risk, are not significant in the normal course of the Company’s business activities. Management of Westamerica Bancorporation and subsidiaries (the “Company”) is responsible for establishing and maintaining adequate internal control over financial reporting, and for performing an assessment of the effectiveness of internal control over financial reporting as of December 31, 2015. Internal control over financial reporting is a process designed to provide reasonable assurance regarding the reliability of financial reporting and the preparation of financial statements for external purposes in accordance with generally accepted accounting principles. The Company’s system of internal control over financial reporting includes those policies and procedures that (i) pertain to the maintenance of records that, in reasonable detail, accurately and fairly reflect the transactions and dispositions of the assets of the Company; (ii) provide reasonable assurance that transactions are recorded as necessary to permit preparation of financial statements in accordance with generally accepted accounting principles, and that receipts and expenditures of the Company are being made only in accordance with authorizations of Management and Directors of the Company; and (iii) provide reasonable assurance regarding prevention or timely detection of unauthorized acquisition, use or disposition of the Company’s assets that could have a material effect on the financial statements. Management performed an assessment of the effectiveness of the Company’s internal control over financial reporting as of December 31, 2015 based upon criteria in Internal Control — Integrated Framework (2013) issued by the Committee of Sponsoring Organizations of the Treadway Commission (“COSO”). Based on this assessment, Management determined that the Company’s internal control over financial reporting was effective as of December 31, 2015 based on the criteria in Internal Control - Integrated Framework (2013) issued by COSO. The Company’s independent registered public accounting firm has issued an attestation report on Management’s assessment of the Company’s internal control over financial reporting. Their opinion and attestation on internal control over financial reporting appear on page 90.